Most transcriptional activity is a result of environmental variability. This cause (environment) and effect (gene expression) relationship is essential to survival in any changing environment. The specific relationship between environmental perturbation and gene expression – and stability of the response – has yet to be measured in detail. We describe a method to quantitatively relate perturbation magnitude to response at the level of gene expression. We test our method using Saccharomyces cerevisiae as a model organism and osmotic stress as an environmental stress. Patterns of gene expression were measured in response to increasing sodium chloride concentrations (0, 0.5, 0.7, 1.0, and 1.2 M) for sixty genes impacted by osmotic shock. Expression of these genes was quantified over five time points using reverse transcriptase real-time polymerase chain reaction. Magnitudes of cumulative response for specific pathways, and the set of all genes, were obtained by combining the temporal response envelopes for genes exhibiting significant changes in expression with time. A linear relationship between perturbation magnitude and response was observed for the range of concentrations studied. This study develops a quantitative approach to describe the stability of gene response and pathways to environmental perturbation and illustrates the utility of this approach. The approach should be applicable to quantitatively evaluate the response of organisms via the magnitude of response and stability of the transcriptome to environmental change. The cause and effect relationship between perturbation and response is routinely used to study and characterize ecosystems in terms of stability. To extend this concept, we investigated the relationship between the affect of different perturbation magnitudes on the dynamic level of transcriptional response. The establishment of a quantitative relationship between stress and response has implications for predictive capabilities related to the behavior of organisms in natural and engineered systems and can be established on many levels including community, population, proteome, and transcriptome. Transcription is often compared by measuring the fold-change in relative expression [1, 2]; however, a simple fold-change approach only accounts for one aspect of the response. Adjusting to perturbation spans a continuum of short-term stress responses, long-term acclimation, and genetic adaptation. Improved analytical tools for understanding the transcriptional mechanisms underlying variation in environmental tolerance will help address key issues such as what distinguishes generalists from specialists, and how do organisms increase tolerance [3, 4]. We evaluate a standard area of displacement to determine the quantitative relationship between perturbation and transcriptional response. We selected Saccharomyces cerevisiae as a model organism because of its existing knowledgebase related to gene expression, particularly in high salt concentration (model stress). Our method demonstrates a linear relationship resulting in a proportional response at very high perturbation magnitudes. Saccharomyces cerevisiae W303 (ATCC 200060) was grown in batch culture at 30°C in YDP medium containing 2% bacto-peptone, 1% yeast extract, and 2% glucose. Cells were harvested by centrifugation, washed, and suspended in YDP to a final OD600 of approximately 0.16. 5 M NaCl was added in triplicate to early log phase (OD600 of ~1.0) cells resulting in a final NaCl concentration of 0.5 M, 0.7 M, 1.0 M, or 1.2 M. Prior to salt addition, a 15 ml sample was collected to characterize the base-line gene expression level. During perturbation, cells were harvested at regular intervals  until growth resumed as indicated by three consecutive increases in OD600. Total RNA was extracted using the modified hot acid phenol extraction method . A 5 μ l sub-sample was removed and reserved for RNA quantification and to check for genomic DNA contamination. All RNA extractions were performed in a dedicated hood, cleaned to reduce or destroy residual RNase activity using either a 10% bleach solution or RNase wipes (Ambion, Austin TX). Extracted RNA was evaluated for DNA contamination using a no-RT control as described previously  with the following PCR conditions as follows: 94°C 2 min, 40 cycles of 94°C 0.5 min, 55°C 0.5 min, 72°C 1 min followed by a final elongation step 72°C 1 min. Amplified PCR products were detected on a 3% agarose gel. Samples containing DNA contamination digested with Turbo™ DNase (Ambion, Austin, TX) at 37°C for 30 minutes and reevaluated for DNA contamination. Sixty genes were selected for observation during osmotic shock based on whether: a) the genes exhibit significant expression to osmotic shock [5, 8, 9], b) the genes show connection to osmotic shock, although insignificant expression in microarray results , and c) the genes are connected with one of the three biochemical pathways associated with salt stress, namely gycolysis, glycerolipid, and the high-osmotic glycerol (HOG) pathway, based on the Kyoto Encyclopedia of Genes and Genomes (KEGG) database  (Table 1). Genes used in this study belonging to one of three osmotolerance biochemical pathways. Primers for each gene were designed using Primer Express™ 2.0 (Perkin Elmer Applied Biosystems, Foster City, CA). Design parameters included a Tm from 58°C to 62°C, GC content from 45% to 55%, length from 20 bp to 22 bp, and amplicon length from 100 bp to 110 bp. Additional design parameters were set according to the manufacturer's suggestions. Specificity of primers was evaluated by gel electrophoresis of the amplified products, and analyzing dissociation curves for amplicons following quantitative real-time PCR. RNA samples were reverse transcribed using a High Capacity cDNA Conversion Kit™ (Applied Biosystems, Foster City, CA), purified using Qiagen PCR purification columns (Qiagen, Valencia, CA) and quantified at 260 nm. 10–20 ng of purified cDNA was added to a reaction cocktail containing the PCR buffer described earlier with 2.5% (vol/vol) SYBR™ Green I (Molecular Probes, Eugene, OR; 1000×), and 2.3 μ M 6-ROX (6-carboxy-x-rhodamine, Molecular Probes, Eugene, OR). PCR was performed on an ABI 7900 HT (Applied Biosystems, Foster City, CA) using the reaction conditions, minus the final elongation step, described earlier. Calibration curves of template dilution series of a 101 bp fragment of inorganic phosphatase and a 106 bp fragment of glycerol-3-phosphate were run in triplicate for each PCR run to normalize differences in amplicon sizes. The 101 bp and 106 bp fragments corresponded to the range of amplicons bounded by the primers designed for selected genes. PCR products were purified using 10,000 MWCO spin columns (Millipore, Bedford, MA), and quantified by absorbance at 260 nm. Purified products were adjusted to the same absorbance and a 1:10 dilution series was prepared as the starting template for the standard curves. Four dilutions from each series (100, 10-2, 10-4, and 10-6) were evaluated for linearity and agreement in cycle threshold (Ct). y(t) = β0 + β1 t1 + β2 t2 + ... β k t k .
Where, β k are the coefficients describing the shape of the relative response and y(t) is the specific model for each relative response envelope from the onset of the perturbation (t = 0) to the last measurement. 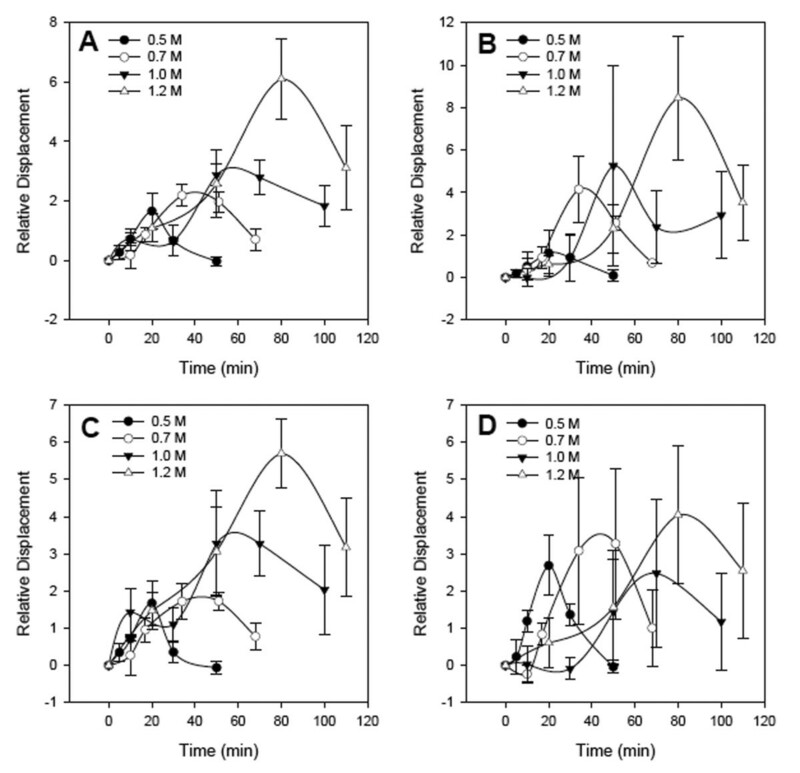 Cell growth in response to NaCl was typified by a lag phase followed by resumption of growth at a reduced rate (Fig. 1) [11–13]. The relative displacement of the selected genes indicates increased expression followed by decreased expression for all perturbation magnitudes tested (Fig. 2) including a return of some genes to pre-perturbed levels (see Fig. 2A). While the lag phase has been hypothesized as an adjustment required for growth in new conditions , it remained unclear why progression through the cell cycle is arrested. By analyzing the response envelope to different salt concentrations, we found that the suspension of growth coincides with the reset to a new steady state (Figs 1 &2). The increasing lag phase and decreased growth rates at greater salt concentrations suggest that exceeding 1.2 M NaCl would result in failure to resume growth in agreement with other reported values [15–17]. 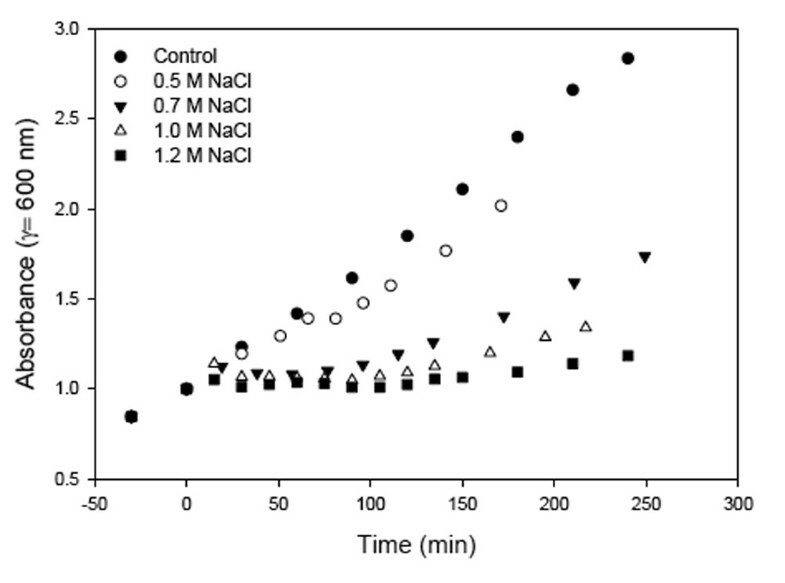 Note, that while high salt concentration results in osmotic stress, high NaCl concentrations can also induce sodium toxicity; however, these results are limited to known osmotolerance mechanisms. Effect of elevated salt concentrations on the growth of S. cerevisiae. 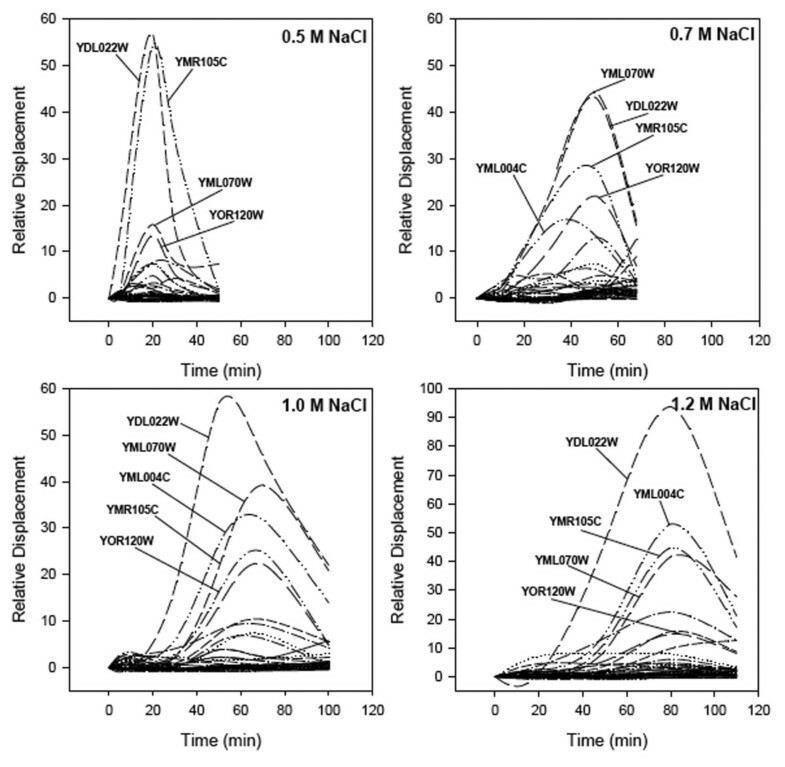 Growth in response to 5 press perturbations of NaCl addition to the growth medium resulting in the final NaCl concentrations indicated. S. cerevisiae displayed the typical behavior to NaCl addition, mainly an arrest in growth at or shortly after the onset of the perturbation followed by a period of adjustment, and then a resumption of growth at a lower rate. The lag period following addition of NaCl to a concentration of 0.5 M was barely detectable, while at the 1.2 M NaCl perturbation resumption of growth was barely noticeable, which suggested at this perturbation magnitude the cell culture had been significantly impacted by the effects of osmotic shock and NaCl toxicity. Relative response envelopes for salt-tolerance genes in S. cerevisiae determined by Q-RT-PCR following perturbation by addition of: A) 0.5 M NaCl, B) 0.7 M NaCl, C) 1.0 M NaCl, and D) 1.2 M NaCl. Three of the genes induced during salt stress (YDL022W, YML070W & YOR120W) are responsible for glycerol production and correspond to the glycerolipid pathway. Two other genes with elevated expression, YML004C and YMR105C, correspond to the high-osmotic glycerol (HOG) and glycolysis pathways, respectively. One of the most dominant genes in all four perturbations is GPD1 (glycerol-3-phosphate dehydrogenase). However, DAK1 (dihydroxyacetone kinase), GLO1 (oxidoreductase), PGM2 (phosphoglucomutase), and GCY1, (phosphatidylserine synthase) follow similar patterns. These genes, in part, produce and regulate glycerol; essential for growth under osmotic stress [18–20]. GPD1, DAK1 and GCY1 are thought to be co-transcribed . Glycerol is synthesized from glucose, and a rate-limiting enzyme in glycerol biosynthesis is the GPD1 gene product, which catalyzes reduction of dihydroxyacetone phosphate to glycerol 3-phosphate [14, 21, 22]. Although the halometric increase of GPD1 and DAK1 has been noted , the increase of GPD1 is proportional to the perturbation up to 1.2 M NaCl, while the abundance of DAK1 plateaus between 0.5 and 0.7 M NaCl (see Figs. 2C &2D). GLO1 detoxifies a cytotoxic metabolite derived from dihydroxyacetone phosphate which increases during glycerol production . PGM2 converts glucose-1 phosphate and glucose-6 phosphate  and is an important factor in glycolysis (eventually leading to glycerol production) as well as the production of other compatible solutes such as trehalose during salt stress. The ecological parameters, resistance and resilience were estimated from the aggregate response envelops, the cumulative displacement of all measured genes (Fig. 3A). From the response envelopes, the degree of resistance was estimated as the maximum displacement, with a larger value for this displacement indicating a lesser degree of resistance . Resilience, measured as the approximate duration of the response, was ~1.4-fold less for the 0.7 M response compared to the 0.5 M response and ~3-fold less for the 1.2 M perturbation compared to the 0.5 M perturbation. Response envelopes for the individual pathways involved in osmotic stress response, the high-osmotic glycerol (HOG) (Fig. 3B) and the Glycerolipid (Fig. 3C) synthesis exhibited monotonic behavior similar to the aggregate set of genes. Contrary to the monotonic increase in response envelope associated with increased stress seen in the two pathways mentioned above, the glycolysis pathway demonstrated a greater resilience at the 0.5 M perturbation compared to the 1.2 M perturbation (Fig. 3D). Relative response envelopes used to calculate strain for: A) the aggregate set of all genes, B) high-osmotic glycerol (HOG), C) glycerolipid metabolism, and D) glycolysis pathways. Relative displacement shown for the pathways was normalized by the number of genes making up each pathway. Comparison of response envelopes between pathways and the aggregate set of genes revealed different trends of behavior with increasing perturbation magnitude. These trends suggested a different contribution of each pathway to the aggregate relative response for each perturbation magnitude. The area of relative displacement increased in response to increased stress. For the aggregate of selected genes (Fig. 4A), the area of relative displacement associated with the 0.7 M stress was approximately 2.4 fold greater with respect to the 0.5 M stress. Overall, the area of displacement increased with stress and exhibited a high degree of linearity (r2 = 0.92), suggesting a linear relationship between osmotic stress and transcriptional response. A linear trend in response to increased stress was also observed for the biochemical pathways (Fig. 4B) with the exception of the glycolysis pathway (r2 = 0.50), where observed increase in the area of relative displacement in response to an increase in stress was not significant. The high degree of linearity for both the glycerolipid and HOG pathways is due to their direct association with osmotic stress (whereas glycolysis regulation is not solely influenced by osmotic stress). 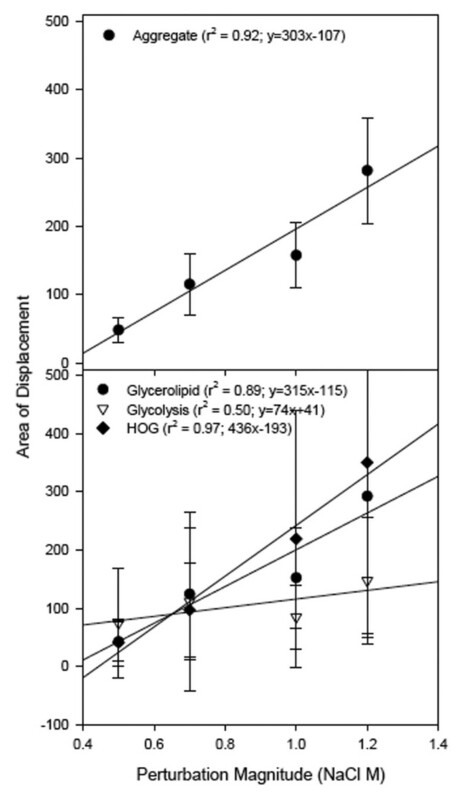 The proportional rate of increase (slope) was most dramatic for the HOG metabolism pathway and glycerolipid production. Because the area of relative displacement includes both the resistance and resilience components of stability, its larger rate of increase suggests these pathways are less stable compared to the glycolysis pathway. Relative area of displacement versus perturbation magnitude for the aggregate response of all genes (top), and genes grouped by biochemical pathway (bottom). A linear relationship was observed between stress and response, with the highest response resulting from the 1.2 M NaCl perturbation. The ability of a system, in this case the set of selected genes and pathways, to adjust to environmental changes has been described as resilience [26–29], and the ability to withstand the effects imposed by the changes – similar to the concept of buffering capacity – has been described as resistance [25, 28]. Resilience at each perturbation magnitude (0.5, 0.7, 1.0, and 1.2 M NaCl) was determined by the time required for either the aggregate set of genes or biochemical pathway to approach pre-perturbed displacement  or the new steady state of S. cerevisiae gene expression following exposure to high salt concentrations . Resistance was estimated as the maximum displacement of the response envelope . In terms of the aggregate set of genes and pathways, a larger stress resulted in decreased resilience (see Figs. 2 &3) and less resistance. Although our model determines the resilience and resistance of S. cerevisiae genes and pathways to elevated NaCl concentrations, this approach can be applied to measure the transcriptional response (positive or negative) to a range of environmental changes. This model is designed to quantify an overall response by determining the change in expression. In the terms of strain, or transcriptome response, down-regulated and up-regulated genes can be represented as a positive response value, for instance one gene that is up-regulated and another equally down-regulated will not cancel each other out, but the response value will be amplified. Examining the response over a prolonged exposure to stress, rather than a snapshot approach, allows the quantification of the response to increased stress. This approach allows a direct comparison of the contribution of each gene or pathway on the aggregate transcriptome. The relationship between fitness and environmental conditions is inherently a multigenic phenomenon requiring this type of an approach. Understanding the relationship between stress, response, and resulting stability at the level of the transcriptome could provide predictive capabilities for other areas of biological research, such as engineering biostimulation for de-toxification of pollutants, and as a predictive indicator for adaptation to changing environments. Stephen J Callister, J Jacob Parnell contributed equally to this work. This work was funded in part by the Center for Microbial Ecology and Intramural Research Grant Program at Michigan State University. Funding for this project was also provided by NSF grant DEB-021212487 to MEP and a USU Center for Integrated BioSystems research grant. We are thankful to Mr. Sean Spellman for help in sample collection. We are also thankful to Dr. Annette P. Thelen, Research Technology Support Facility at Michigan State University for help with sample preparation and quantitative real-time PCR. SJC and SAH designed this study, SJC collected and analyzed data, SJC, JJP and MEP interpreted data and wrote the manuscript, all authors read and approved the final draft.